Takeoff from Hawaii scheduled, finally! We knew this day would come where we can finally say: tomorrow we will be taking off. After 9 months having put our round-the-world solar flights on hold because of a battery complication during the 5 day/night flight from Nagoya to Hawaii, we are able to resume our attempt to accomplish this solar-powered challenge. 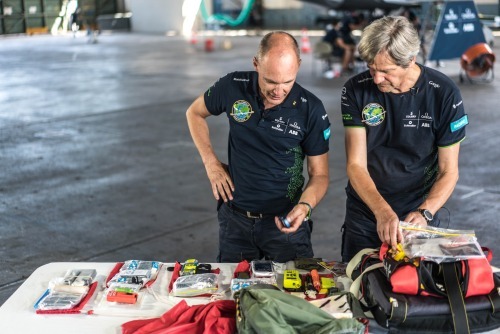 Become a part of our adventure by tuning into our website and reading our logbook while watching solarimpulse.com. If you haven’t already, you can subscribe here and you will be notified whenever we have an update to share with you. If you have already subscribed, then you can tweak your subscriber preferences here in order to regulate the amount of updates you receive from us during the Mission. You have two choices: interactive and basic. Become an interactive crew member and you will receive regular updates announcing important milestones before, during and after the flight, as well as being the first to receive our most interesting releases that have been prepared only for you. Become a basic crew member and you will receive the main newsletters and be notified of the most important releases and events.